For chocolate and peanut butter lovers everywhere, I shall attempt to solve a great mystery. Does higher price mean better flavor? If the answer is YES, then the value is clear. The big price tag is worth it because great taste is the ultimate payoff. However, is there any certainty that higher price IS better flavor? Read on! How much will you pay for your chocolate and peanut butter fix? 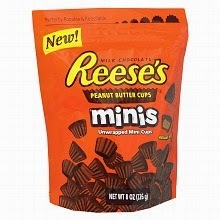 If you want to buy the NAME BRAND, Reese's Peanut Butter Cups Minis, the price is $2.50 for an 8 ounce bag at Walmart. It is a little over 31 cents per ounce. Have you tried Walmart's Great Value Peanut Butter Cups? The price per ounce definitely less expensive. You'll pay $2.82 for a 12 ounce bag. The price per ounce is 23.5 cents. Ever been to an Aldi store? Their Choceur Peanut Butter Cups cost $2.49 for a 12 ounce tub. That's a little less than 21 cents per ounce. The price of a good peanut butter cup can vary from store to store. The prices for this post were calculated in November 2013 and will undoubtedly change over time. 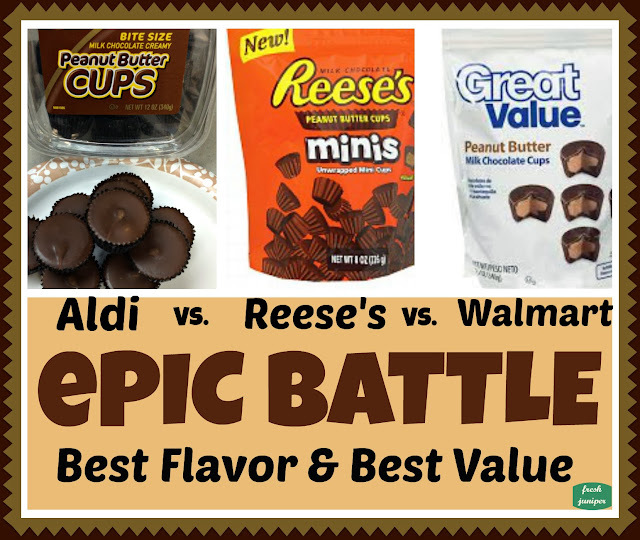 Which Peanut Butter Cup really tastes the best? Reese's Peanut Butter Cups are delicious. They are the candy everyone else tries to copy. The flavor is wonderful. The chocolate covering is sweet and rich. The peanut butter center is less moist than Aldi Choceur or Walmart Great Value. They taste as good as any (non-gourmet) peanut butter cup on the market. 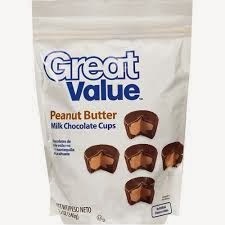 Walmart Great Value Peanut Butter Cups are wonderful. They provide a tasty alternative to the pricier Reese's brand. The chocolate shell is almost just as good as Reese's and the peanut butter center is the most moist, gooey, and sweet of the three brands compared in this post. If you don't mind the extra gooey center, they REALLY are a "Great Value". I love them and buy them often. I am a new fan of Aldi Choceur Peanut Butter Cups. The chocolate shell is rich and delicious. The flavor is equal to any (non-gourmet) competitor on the market. The peanut butter center is moist but not gooey. The consistency and flavor of the peanut butter is amazing. 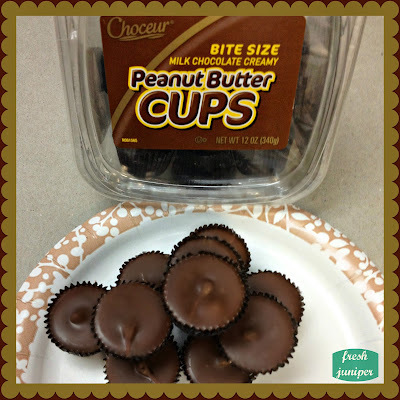 The easy winner for overall flavor and value is Aldi Choceur Peanut Butter Cups. Surprisingly, they are the least expensive of the brands compared. The price even beat the Walmart brand. The Aldi Choceur Peanut Butter Cups are JUST as delicious as Reese's. In fact, I might actually prefer the flavor of the chocolate and the peanut butter OVER Reese's. The combination of rich, sweet milk chocolate with creamy (not too gooey), delicious peanut butter satisfies my 'sweet and salty' cravings 100%. Congratulations to Aldi Choceur Peanut Butter Cups. You win! 1. This is NOT a sponsored post. 2. I AM a chocolaholic. 3. My given name is REECEA (pronounced REE sa). This name has been the subject of "Reese's" or "Reese's Peanut Butter Cups" references and jokes since the mid 1960s. 4. I LOVE the taste of quality peanut butter cups. 5. Many peanut butter cups have been absolutely annihilated during years of preparation for this post. Most of them were delicious. 6. In my 50+ years, I have probably tasted every brand of (non-gourmet) peanut butter cup on the market. I like the the three brands compared in this post best of all. This is awesome. So many applicable and easy ways to save money. This blog is becoming my favorite. I wholeheartedly concur with this. I've actually not tried the Wal-Mart cups, but the Aldi ones are ridiculously good. Personally, I think they even blow away Reese's in terms of flavor. Good post. Diamond Candles Review and Giveaway!